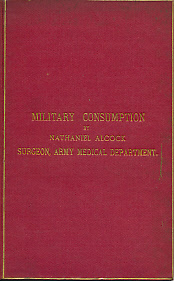 Barter Books : Alcock, Surgeon Nathaniel : An Essay on the Nature and Variation of Destructive Lung Disease Included Under the Head of 'Pulmonary Consumption', as Seen Among Soldiers, and the Hygienic Conditions Under Which They Occur. Author's inscription. 250 x 150 mm (10 x 6 inches) - 19pp + charts. G+: in Good condition plus without dust jacket. Ex Royal College of Surgeons Ireland Library. Appendix to Report for 1872. 'With author's comps' inscribed on fep.